Rajesh Shakya is the 'Ask Donald J. Trump Contest' winner. Donald J. Trump selected his question as the winning question out of the 564 entries. Personally, it really made us feel great, when we as a Nepalese is proud to introduce us to the world with some award winning honoring events. Rajesh’s Winning Question to Donald J. Trump . . .
And the answer from Donald J. Trump . . .
“The two most important things to consider are focus and momentum. If you lose either one of them, it’s hard to stay at the peak of your form. Safeguard them both and your chances for continued success are much greater. 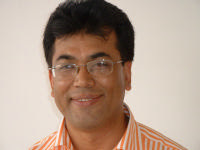 for more info about Rajesh Shakya and his participation, here is the link to his blog.